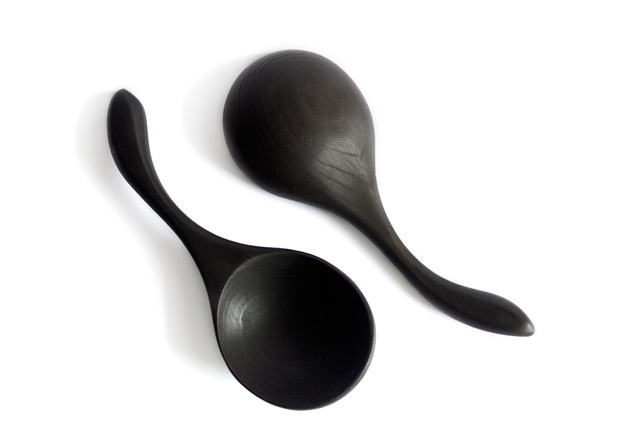 We are big fans of nice aesthetics here, and our flame-blackened ladle from Jonathan’s Spoons is a perfect example. At once both masculine and feminine; dramatic and sophisticated; beautiful and functional. Jonathan Simons handcrafted this ladle with care in Pennsylvania with sustainably-harvested cherry wood, and then achieved its rich color with a flame-blackening technique. He and his family have been crafting these stunning tools for decades now, and business is booming. Add a ladle, and our other flame-blackened utensils to your collection, and behold the striking difference that it makes in your kitchen. And if the Halloween spirit has got you feeling particularly spooky, this ladle with look spectacular with a cauldron.